Khwaja Muhammad Saeed (Q) was the second son of Imam-e-Rabbani (Q). He was born in Sha'ban 1005 AH or March-April 1597 A.D. He learned his early and higher education in both secular and spiritual sciences from his father Imam-e-Rabbani (Q). At the age of 10 years, he not only graduated in secular sciences, but also reached the zenith of spiritualism.Khwaja Imam-e-Rabbani (Q) used to say: "My Son Muhammad Saeed is a perfect scholar." Many notable scholars like Molana Abdul Hakim Sialkoti, Mula Sa'adullah, minister of then sultan of India, were among his pupils. He had, on a number of occasions, arguments relating to altercations in the religion, but no one could stand before his grip over the references and diversity of knowledge.Khwaja Muhammad Saeed (Q) had also authored a number of books on Sufism and jurisprudence. A compilation of his letters is equally important to Maktoobat-e-Mujadidia of Imam-e-Rabbani (Q). His other works include a book on those Hadith on which the Hanafi jurisprudence is based. He also had written an antithesis about raising forefinger during prayers.About his spiritual attainment, Khwaja Imam-e-Rabbani (Q) said: "Muhammad Saeed (Q) has written about his affairs, all are true and noble. These affairs are not divulged on any of the friends with the peculiarity. "He also used to say "anyone who would enter into the heaven, but by the stamp of Muhammad Saeed." Khwaja Muhammad Saeed (Q) also performed Hajj along with his younger brother Khwaja Muhammad Masoom (Q). It is related in his various accounts that when he went to pay respects at the Shrine of Prophet (PBUH) a celestial voice was heard, "Quickly, quickly; I am desirous of you. "His name and fame Prevailed far and wide. Even the ruler of India king Alamgir also heard a lot about his marvels. He summoned him in Shahjehanabad. 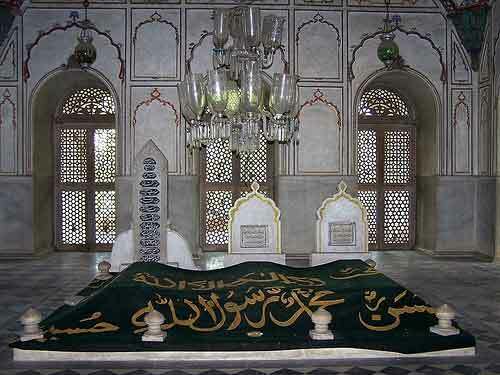 Khwaja Muhammad Saeed (Q) went to him, but fell sick. He took permission of the king and proceeded back, but bode adieu to the mortal world at Sanbalakh, 36 miles away from Shahjehanabad, on Jumadi-al-Sani 8, 1070 AH., January 15, 1665 A.D. His sacred body was taken to Sirhind. His brother Khwaja Muhammad Masoom (Q) ordered to lay him to rest in the shrine of Khwaja Imam-e-Rabbani (Q). Though initially, there was no space available there, but later it happened. He was succeeded on the Seat of The Naqshbandia order by his son Khwaja Abdul Ahad (Q).